Twisting is clinically the most frequently applied method for tightening and maintaining cerclage fixation. The twisting procedure is controversially discussed. Several factors during twisting affect the mechanical behaviour of the cerclage. This in vitro study investigated the influence of different parameters of the twisting procedure on the fixation strength of the cerclage in an experimental setup with centripetal force application. Cortical half shells of the femoral shaft were mounted on a testing fixture. 1.0 mm, 1.25 mm and 1.5 mm stainless steel wire cerclages as well as a 1.0mm cable cerclage were applied to the bone. Pretension of the cerclage during the installation was measured during the locking procedure. Subsequently, cyclic testing was performed up to failure. Higher pretension could be achieved with increasing wire diameter. However, with larger wire diameter the drop of pretension due to the bending and cutting the twist also increased. The cable cerclage showed the highest pretension after locking. Cerclages twisted under traction revealed significantly higher initial cerclage tension. Plastically deformed twists offered higher cerclage pretension compared to twists which were deformed in the elastic region of the material. Cutting the wire within the twist caused the highest loss of cerclage tension (44% initial tension) whereas only 11 % was lost when cutting the wire ends separately. The bending direction of the twist significantly influenced the cerclage pretension. 45% pretension was lost in forward bending of the twist, 53% in perpendicular bending and 90% in backward bending. Several parameters affect the quality of a cerclage fixation. Adequate installation of cerclage wires could markedly improve the clinical outcome of cerclage. Cerclages are attractive fixation devices to be used in combination with an intramedullary nail (19), with aprosthesis stem (1) or together with a plate as internal splint. Moreover the cerclage may be applied as reduction and fixation tool for dislocated fragments. The application of a cerclage wire or cable is a standardized procedure. The cerclage is looped around the bone and is finally tightened to establish compression. Twisting the wire ends is the clinically most applied method to tighten the loop. Cerclages show potential particularly in situations where screw placement is difficult, e.g. in periprosthetic fractures where the prosthesis stem blocks the intramedullary canal. Here, monocortical screws provide only limited fixation strength. When bicortical screws are considered (14, 30) they need to be tilted to avoid collision with the stem of the prosthesis. Locking plates may be equipped with eyelets at unfilled screw holes in order to constrain the cerclage to the plate. Some special plates already provide holes for cerclage attachment. However, there is a controversy regarding the use and benefit of cerclage wires and cables among orthopaedic and trauma surgeons. These discussions range from biological aspects such as a potential strangulation of the periosteal blood supply (20, 24, 34) over reports of broken wires migrating into the vascular system (2,16, 17) to biomechanical concerns (8, 9, 13, 22, 31). However, only a few studies investigated the biomechanical aspects of cerclage wiring in detail (11, 21). The majority compared different cerclage closure techniques or cerclage materials (5, 10, 18, 28). Some studies questioned the sufficiency of the twisted closing procedure of the wire loop (4, 10, 27, 33). The procedure of closing the loop is believed to be a major factor influencing the outcome of a cerclage fixation. Adequate pretensioning is essential when applying cerclages. To avoid fracture gap motion and subsequent bone resorption, long lasting pre-tension is mandatory (23). In wire cerclages, particularly the quality of the twist or knot plays a key role for maintaining fragmental compression. Only minimal lengthening of the cerclage could lead to a considerable decrease in tension. Several steps of the twisting procedure in wire cerclage closure can affect the quality of the twist. Simple adaptations in the cerclage closing technique may significantly improve the performance of the fixation. A systematic investigation on wire closing is, however, still missing. 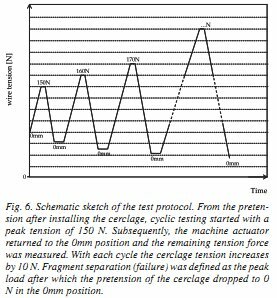 Different aspects of the twisting procedure, such as wire diameter, deformation of the twist, applied traction during twisting, cutting procedure and bending direction of the twist were investigated in this study with regard to pre-tension and progression of tension under cyclic loading. For this study fresh-frozen human femoral diaphyseal bone (15) was used. Soft tissues including the periosteum were removed prior to testing. A 25 mm long fragment was cut from the mid-diaphysis. The intramedullary canal was reamed with a 20 mm drill bit. The fragment was cut in two parts in the coronal plane. The prepared diaphyseal bone shells were mounted to two metallic half cylinders with a radius of 10mm forming a full circle. The upper half cylinder was rigidly attached to the actuator of a servohydraulic testing system (Bionix 858.20; MTS Systems, Eden Prairie, USA). The lower half cylinder was affixed to a 25 kN load cell (Fig. 1). A gap of 1 mm was maintained between the metallic half cylinders in order to avoid load transfer via the testing jig and full load bearing of a cerclage fixation entangling the bone fragments (Fig. 2). The setup allowed controlled separation of the bony half-shells and measurement of the resulting distraction force. Cerclage diameter. We used a 1.25 mm stainless steel cerclage wire as standard and additionally 1.0 mm and 1.5 mm cerclage wires (Synthes GmbH, Solothurn, Switzerland) for a diameter comparison. A 1.0 mm cerclage cable (Synthes, Solothurn, Switzerland) with a crimp was investigated to compare the wire fixation to a cable cerclage (Fig. 3). Traction during cerclage twisting. Twisting of the cerclage wire was performed with conventional surgical pliers with permanent pull on the cerclage wires (traction) or without pull (Fig. 4). Degree of deformation. The effect of twisting the cerclage up to elastic or plastic deformation of the cerclage material was investigated. Twisting was stopped within the elastic range of the wire or was continued up to a plastic deformation of the wire at the innermost turn. In a third group (breakage) the wire was twisted off, so that breakage of the twist occurred (Fig. 4). Cutting after twisting. The effect of the cutting procedure on the cerclage pre-tension was investigated. The wires were cut with a side-cutting plier distally to the twist or within the twist or cutting was omitted (Fig. 4). Bending direction. The influence of the bending direction of the twist on the cerclage pre-tension was investigated by applying the following modes: forward bending - in the direction of the twisting, backward bending - in opposite direction of the twisting and perpendicular bending (Fig. 5). Five specimens were tested per study-group. All cerclages were applied by the same surgeon. Twisting was performed with conventional surgical pliers. All wire twists formed four to six turns. Detailed information about the study-groups is given in Tab. 1. Cerclages were manually installed according to the mentioned protocol. The load-cell of the testing machine allowed recording of the cerclage-tension throughout the application procedure. The application of the cerclage was followed by cyclic loading. Starting at the level of the remaining cerclage tension, the load was increased to 150 N cerclage tension at 40 N/s. Afterwards the machine actuator returned at 40 N/s to the initial position and the remaining cerclage tension was recorded for 5 s before the next cycle started. With every cycle the peak cerclage tension was increased by ION until the pre-tension in the cerclage was entirely lost or until failure of the fixation occurred (Fig. 6). Time, axial load and displacement were recorded from the test system's transducers, at a frequency of 64 Hz. Cerclage tension was defined as half tension force as measured by the load-cell (Fig. 2). From the load progression the initial cerclage tension, the cerclage tension after locking (twist tightening, cutting and bending flat) and the cerclage tension at fragment separation were determined. The tension at fragment separation was defined as the peak load after which the pretension of the cerclage (at initial position) dropped to 0 N.
Statistical analysis was performed with SPSS software (SPSS 18; SPSS, Chicago, USA). Normal distribution within each group was tested with the Shapiro-Wilk Test. For the detection of differences between groups independent t-tests were performed. P-values were corrected according to Bonferroni, if more than two groups were compared. Significance was defined as p < 0.05. All wire diameters showed significant different initial wire tensions after twisting (all p < 0.001, Tab. 2). The larger the wire diameter, the higher was the initial compression force. The initial tension in the 1 mm cable was comparable to the 1.25 mm wire (p < 0.99). After locking (cutting and bending down the twist) the remaining percentage cerclage tension decreased with increasing wire diameter. The cable cerclage provided the significantly highest tension after locking (p < 0.001). For the 1.25 mm and 1.5 mm wires the tension after locking was not significantly different (p = 0.14). The applied tension at fragment separation was significantly different between all tested groups (all p < 0.001; Tab. 2, Fig. 7). The highest peak tension was borne by the cable cerclage before opening occurred. When using wires the tension at fragment separation increased significantly with the wire diameter. The mean remaining pretension in the cerclage systems after every cycle is shown in Fig. 7. Twisting the cerclage without applied traction produced significantly less cerclage tension/interfragmentary compression compared to twisting under traction (p<0.001; Tab. 3). 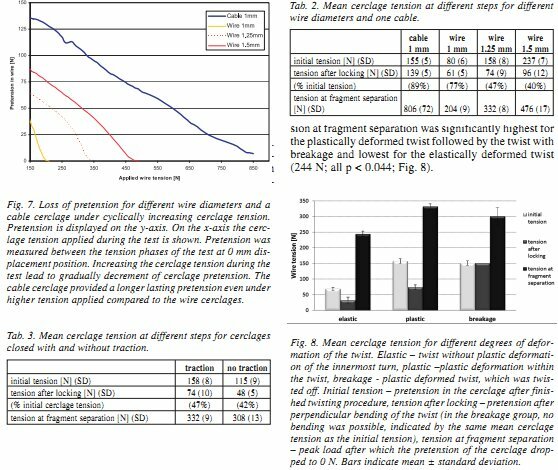 After locking, for both conditions 47% respectively 42% cerclage tension remained (p = 0.001). The cerclage tension at fragment separation was significantly higher for the cerclage loops closed under traction (p = 0.009; Tab. 3). The initial cerclage tension did not differ significantly between the plastic deformation and the twist breakage groups (p = 0.43). For elastic deformation an initial cerclage tension of 45% compared to plastic deformation was observed (p < 0.001). After locking the twist the cerclages with elastic and plastic deformation showed 47% remaining pretension compared to 100% tension of the cerclages with breakage. The cerclage tension at fragment separation was significantly highest for the plastically deformed twist followed by the twist with breakage and lowest for the elastically deformed twist (244 N; all p < 0.044; Fig. 8). Cutting within the twist caused the significantly highest loss of cerclage pretension: 56% of tension was left compared to 88% when cutting only the wire protrusions (p = 0.033). There was no statistical significant difference if the protrusion was cut or no cut was performed (p = 0.64). The perpendicular bend caused an additional loss of pretension: without a previous cut 58% of the initial cerclage tension remained. After cutting the wire ends (protrusions) and bending 37% tension was left and after cutting within the twist and subsequent bending 21% of cerclage tension was left (Fig. 9). There was no statistical significant difference between the no-cut group compared to cutting the wire ends (p = 0.058). Three different bending directions were investigated. Even though a comparable initial cerclage tension was installed for all samples (all p > 0.05), the cerclage tension after bending the twist differed significantly. The backward bent twist generated the highest loss of pretension. 10% of the initial cerclage tension was left. In comparison, 47% and 55% respectively of the initial cerclage tension were left when the twist was bent perpendicular or forward (Fig. 10). The difference between the perpendicular and the forward bent twist was not significant (p = 0.25, both other p < 0.001). The cerclage tension at fragment separation also differed significantly between the backward bent twist and the other bending directions (both p < 0.001). Mean cerclage tension was 178 N for the backward bent compared to 332 N and 334 N for the perpendicular and forward bent twist respectively (Fig. 11). With p > 0.99 the difference between the perpendicular and forward bent twist was not statistically significant. 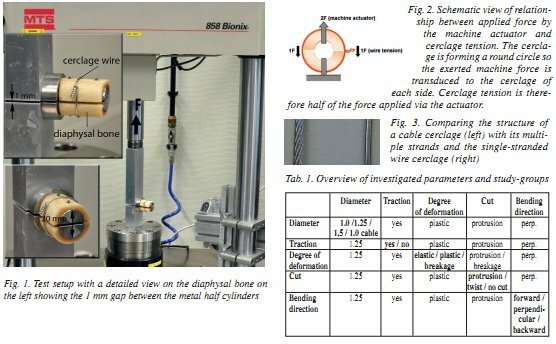 In this study we investigated parameters influencing the cerclage tension and the load to fragment separation for twisted wire cerclages and a cable cerclage in a cyclic test. Compared to Blass et al, we used a modified test setup by mounting half shells of human femoral shaft bone on metal bars, providing more physiologic conditions with a cerclage bone interface which is especially important during cerclage twisting and settling (3). Furthermore with this test setup we simulated the centripetal forces affecting the cerclage applied to the fractured shaft. In this study we focused on the symmetric twist, which is most frequently applied in the clinical situation (10, 27). Oh et al. observed that even minimal notching of a cerclage wire caused a significant decrease in mechanical fatigue life, whereas twisting the wire had no influence on the fatigue performance (21). Using a larger wire diameter led to a substantial increase in initial tension, pretension after locking and tension at fragment separation, which is in line with previous findings (4,18, 27, 29, 33). However, the drop in pretension after locking (see Table 2) was much higher in the larger wire diameters, leading to a final tension, comparable to that of the lmm wire, whereas the cable due to the different closing procedure with a crimp lost only a small amount of pretension after locking. Affirming the literature, 1 mm cable cerclage provided a higher strength than all tested wires (5, 7). Although the initial cerclage tension is higher for wires with larger diameter, the 1.0 mm cable cerclage achieves nearly twofold the initial tension of the 1.0 mm cerclage wire after locking. Due to a different closing procedure with a crimp, the cable cerclage was advantageous in maintaining pretension during closure compared to the wire cerclage groups. The difference between cable and wire cerclages became even more obvious during cyclic testing, but with increasing diameter the wire cerclages sustained increasing forces until pretension was lost. Opposed to the opinion of Carls et al, that using a cerclage cable is a more complex method (5), the procedure appeared solidly standardized. Reproducible results could easily be achieved without the tuned mechanical sense necessary for cerclage wires. Ritter et al. found no significant differences in their clinical study comparing the results of cerclage wires and cables for the treatment of periprosthetic proximal femur fractures (25). By reason of the higher costs they recommend the use of cerclage wires. Several studies mentioned the importance of applying traction via the pliers during twisting the wire cerclage and determined the maximum cerclage tension applicable before failure of different knots (4, 6, 28). Compared to other wire knots, a major advantage of the symmetrical twist performed with pliers is the possibility to generate tension during twisting. Our results indicate that twisting the wire cerclage under permanent traction facilitates the installation of pretension. This is consensual with previous findings from Harnroongroj et al. who observed higher stiffness with higher degree of tightening the construct (11). With regard to the cyclic behavior (tension at fragment separation) we observed decreased influence of traction during twisting. Incavo et al. found a small increase in failure load of cerclage twists performed with commercial wire tighteners compared to common pliers (12). Cheng et al. reported the lowest initial compression when twisting the cerclage with pliers (6). They achieved an initial compression of about 20 N with a 1mm wire. In our experimental setting we were able to generate a reproducible initial compression of about 80 N for the 1 mm wire. We agree that twisting with pliers needs a good mechanical feel to produce an optimally tightened cerclage twist (28). The initial interfragmentary compression, which directly depends on the cerclage pre-tension, is important for fracture fixation and for prevention of postoperative fracture dislocation (18, 27). From our results, it appears also necessary to ensure a plastic deformation in the twisted part of the wire to produce a sufficiently tightened and stable cerclage. According to the literature, two twists at least are necessary to maintain stability of the cerclage and more than two twists cannot further increase fixation strength (10, 27). We observed both, higher pretension after locking the cerclage and increased ability to sustain forces during cyclic loading when deforming the twist plastically rather than purely elastic. This also applies when breaking the twist and is consistent with previous findings, detecting a higher cerclage tension after twist breakage than after closure without breakage (26). The high pretension after locking in the breakage group could also be explained by the missing bending procedure of the twist at locking. Bending was shown to lead to loss of pretension in all bending directions. The lasting tension after plastic deformation or breakage within the twist might be due to a form closure of the wire ends. Nevertheless we observed that a plastically deformed wire twist even with higher diameter (1.5 mm) provided only about half of the strength at fragment separation as a crimped cable with lower diameter (1.0 mm). Von Issendorff et al. investigated the strength of different wire knots and a crimped cable in a material test setup with a static load ramp (32). They found a failure of the wire cerclage by unravelling the twist at half the force necessary to induce a failure of the cable cerclage. In contrast to our results, they observed an immediate loss of pretension for the twisted wires after finishing the twisting procedure. The degree of wire deformation within the twist is not mentioned in the paper. We were able to produce a pretension in a wire cerclage with a plastically deformed twist in a more physiologic setup with circular application of the cerclage on human cortical bone and periodical loading. The cerclage wires exhibited a significant loss of cerclage tension due to the cutting procedure. The loss was markedly higher if the wire was cut within the twist compared to cutting the protruding wire ends. Rooks et al. already observed the adverse influence of the cutting procedure on the cerclage tension for wires twisted off and subsequently cut below the breakage as well as for wires twisted without breakage (26). Thus, even a plastic deformation of the twist, which necessarily occurs before wire breakage during twisting, is not sufficient to compensate the tension loss of the cutting procedure. A plastically deformed twist is fastened by the deformation of the wire material and by the friction of the wire ends within the twist. During the cutting procedure the wire is partially untwisted by the end-cutting pliers squeezing the wires against each other. This might decrease the friction between the wires such that the wires can slide down within the twist, leading to a partial opening (26). As mentioned above, the major portion of the cerclage tension is installed at the very last degrees of tightening the cerclage. Only a slight opening is enough to produce an ample loss of tension. The majority of biomechanical studies on cerclages performed only static tests and investigated different knot and wiring techniques (4,10, 12, 33). The bending direction of the twist, as an important factor for tension loss, had never been investigated in detail before. Up to now there was only data published on changes in pretension while securing the twist against untwisting (18, 28). Meyer et al. reported a decrease of the pretension by 84%, 38% and 19% for 1 mm, 1.25 mm and 1.5 mm wires while securing the twist, but did not mention the bending direction of the twist during the securing procedure. Furthermore they used a different test setup without a circularly applied cerclage. The results of Meyer et al. are different from ours, since we found a lower decrease of pre-tension for the smallest diameter. This might be due to a different bending procedure, since we performed a perpendicular bending without the complete turn necessary for securing the twist. Investigating the influence of the bending direction, our results were superior for the forward and perpendicular bent twists compared to the backward bent twist. From a mechanical point of view our results could be explained by a partial opening of the cerclage when bending the twist in the backward direction, because a part of the last turn is untwisted during backward bending. The generally high loss of tension during bending in all directions can be attributed to the fact that most of the tension is built up on the very last degree of tightening. This demonstrates also the mechanical fragility of the twist. When closing a wire cerclage several factors have to be taken heed of to obtain a long lasting stable twist. Cable cerclages, closed with a crimp provide a simple, reliable and robust closure. In contrast, the mode of application of cerclage wires results in important changes of the installed cerclage pretension. Study and understanding of these changes are essential because the feedback provided during application does not allow the surgeon to judge the quality of cerclage fixation. We suspect that many of the unsatisfactory results reported are due to shortcomings of the application procedure. 1. BARTONÍČEK, J., LUNACEK, L., FRIC, V.: S-ROM Modular THR System - Three and Half Years of Experience. Acta Chir. orthop. Traum. Čech., 67(6): 372-381, 2000. 2. BIDDAU, E., FIORITI, M., BENELLI, G.: Migration of a broken cerclage wire from the patella into the heart. A case report. J. Bone Jt Surg. Amer., 88(9): 2057-2059, 2006. 3. BLASS, C. E., PIERMATTEI, D. L., WITHROW, S. J., SCOTT, R. J.: Static and Dynamic Cerclage Wire Analysis. Vet. Surg., 15(2): 181-184, 1986. 4. BOSTROM, M. P., ASMS, S. E., ERNBERG, J. J., WRIGHT, T. M., GIDDINGS, V. L., BERBERIAN, W. S., MISSRI, A. A.: Fatigue testing of cerclage stainless steel wire fixation. J. Orthop. Trauma, 8(5): 422-428, 1994. 5. CARLS, J., KOHN, D., ROSSIG, S.: A comparative study of two cerclage systems. Arch. Orthop. Trauma Surg., 119(1-2): 67-72. 1999. 6. CHENG, S. L., SMITH, T. J., DAVEY, J. R.: A comparison of the strength and stability of six techniques of cerclage wire fixation for fractures. J. Orthop. Trauma, 7(3): 221-225, 1993. 7. DALL, D. M., MILES, A. W.: Re-attachment of the greater trochanter. The use of the trochanter cable-grip system. J. Bone Jt Surg. 65-B: 55-59, 1983. 8. DENNIS, M. G., SIMON, J. A., KUMMER, E. J., KOVAL, K. J., DI CÉSARE, P. E.: Fixation of periprosthetic femoral shaft fractures: a biomechanical comparison of two techniques. J. Orthop. Trauma, 15(3): 177-180, 2001. 9. DENNIS, M. G., SIMON, J. A, KUMMER, E J., KOVAL, K. J., DICES ARE, P. E.: Fixation of periprosthetic femoral shaft fractures occurring at the tip of the stem: a biomechanical study of 5 techniques. J. Arthropl., 15(4): 523-528, 2000. 10. GUADAGNI, J. R., DRUMMOND, D. S.: Strength of surgical wire fixation. A laboratory study. Clin. Orthop. Relat. Res., (209): 176-181, 1986. 11. HARNROONGROJ, T.: Twist knot cerclage wire: the appropriate wire tension for knot construction and fracture stability. Clin. Biomech. (Bristol., Avon. ), 13(6): 449-451, 1998. 12. INCAVO, S. J., DIFAZIO, E., WILDER, D.: Strength of cerclage fixation systems: a biomechanical study. Clin. Biomech., 5(4): 236-238, 1990. 13. KANAKIS, T. E., CORDEY, J.: Is there a mechanical difference between lag screws and double cerclage? Injury, 22(3): 185-189, 1991. 14. KRBEC, M., MOTYČKA, J., LUNACEK, L., DOUSA, P.: Osteosynthesis for periprosthetic supracondylar fracture above a total knee arthroplasty using a locking compression plate. Acta Chir. orthop. Traum. Čech., 76(6): 473-478, 2009. 15. LIU, A., O'CONNOR, D. O., HARRIS, W. H: Comparison of cerclage techniques using a hose clamp versus monofilament cerclage wire or cable. J. Arthropl., 12(7): 772-776, 1997. 16. MAKKI, D. Y., GORU, P., PRAKASH, V., ALDAM, C. H.: Migration of a Broken Trochanteric Wire to the Popliteal Fossa. J. Arthropl., 2010. 17. MEHTA, V., FINN, H. A.: Femoral artery and vein injury after cerclage wiring of the femur: a case report. J. Arthropl., 20(6): 811-814, 2005. 18. MEYER, D. C., RAMSEIER, L. E., LAJTAI, G., NOTZLI, H.: A new method for cerclage wire fixation to maximal pre-tension with minimal elongation to failure. Clin. Biomech. (Bristol., Avon. ), 18(10): 975-980, 2003. 19. MUNOZ-MAHAMUD, E., BORI, G., CUNE, J., FONT, L., DOMINGO, A., SUSO, S.: Results of treatment of subtrochanteric femoral fractures with the AO/ASIF Long Trochanteric Fixation Nail (LTFN). Acta Chir. orthop. Traum. Čech., 76(6) : 451-455, 2009. 20. NYROP, K. A., DEBOWES, R. M., FERGUSON, H. R., LEIPOLD, H. W., WILSON, J. W., GUFFY, M. M.: Vascular response of the equine radius to cerclage devices. Vet. Surg., 19(4): 249-253, 1990. 21. OH, I., SANDER, T. W., TREHARNE, R. W.: The fatigue resistance of orthopaedic wire. Clin. Orthop. Relat. Res., (192): 228-236, 1985. 22. OLD, A. B., McGRORY, B. J., WHITE, R. R., BABIKIAN, G. M.: Fixation of Vancouver Bl peri-prosthetic fractures by broad metal plates without the application of strut allografts. J. Bone Jt Surg. Br., 88(11): 1425-1429, 2006. 23. PERREN, S. M., FERNANDEZ DELLOCA, A., LENZ, M., WINDOLF, M.: Cerclage, evolution and potential of a Cinderella technology. An overview with reference to periprosthetic fractures. Acta Chir. orthop. Traum. Čech., 78 (3): 190-199, 2011. 24. RHINELANDER, E. W., STEWART, C. L.: Experimental fixation of femoral osteotomies by cerclage with nylon straps. Clin. Orthop. Relat. Res., (179): 298-307, 1983. 25. RITTER, M. A, LUTGRING, J. D., DAVIS, K. E., BEREND, M. E., MEDING, J. B.: A clinical, radiographic, and cost comparison of cerclage techniques: wires vs cables. J. Arthropl., 21(7): 1064-1067, 2006. 26. ROOKS, R. L., TARVIN, G. B., PIJANOWSKI, G J., DALY, W B.: In Vitro Cerclage Wiring Analysis. Vet. Surg., 11(2): 39-43, 1982. 27. SCHULTZ, R. S., BOGER, J. W., DUNN, H. K: Strength of stainless steel surgical wire in various fixation modes. Clin. Orthop. Relat. Res., (198): 304-307, 1985. 28. SHAW, J. A., DAUBERT, H. B.: Compression capability of cerclage fixation systems. A biomechanical study. Orthopedics, 11(8): 1169-1174, 1988. 29. STEINBERG, E. L., SHAVIT, R: Braided cerclage wires: A biomechanical study. Injury, 2010. 30. TOMAS, T., NACHTNEBL, L., OTIEPKA, P.: Distal femoral periprosthetic fractures: classification and therapy. Acta Chir. orthop. Traum. Čech., 77(3): 194-202, 2010. 31. VOIGT, C., HURSCHLER, C., RECHI, L., VOSSHENRICH, R., LILL, H.: Additive fiber-cerclages in proximal humeral fractures stabilized by locking plates: no effect on fracture stabilization and rotator cuff function in human shoulder specimens. Acta Orthop., 80(4): 465-471, 2009. 32. VON ISSENDORFF, W. D., AHLERS, J., RITTER, G.: [Tension band wiring osteosynthesis-studies on tension and fixation of the osteosynthesis wire]. Unfallchirurgie, 16(6): 277-285, 1990. 33. WILSON, J. W: Knot strength of cerclage bands and wires. Acta Orthop. Scand., 59(5): 545-547, 1988. 34. WILSON, J. W., RHINELANDER, E. W., STEWART, C. L.: Microvascular and histologie effect of circumferential wire on appositional bone growth in immature dogs. J. Orthop. Res., 3(4): 412-417, 1985.